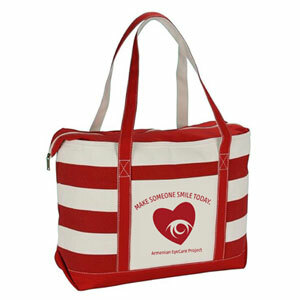 Carry all of your beach or overnight necessities in this extra-large tote bag! This strong, durable bag is made of 18 oz. cotton canvas. A convenient front pocket is perfect for keeping your cell phone within reach. The zippered top closure is useful whether you’re on the water or in the office. The nautical look of this bag is timeless in a sea-faring red to accent the natural color of the bag. Size: 14″ x 23″ x 7″.